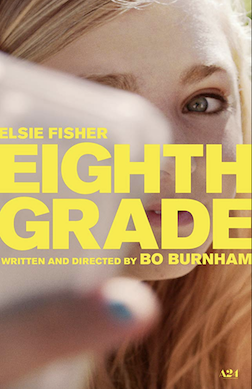 You can make an argument that the eighth grade may be the most difficult transitional period for a young girl. This film certainly makes this case. Certainly, the storyline shows that the main character is struggling with her own identity, friendships with others and her relationships with her single parent dad. (Although the other girls in her class seemed happier?) We hardly know anything about the details of her family. She has no siblings and only her dad is in the picture. It is also no surprise that the girl and most of her contemporaries are on their cell phone all the time. Social media also plays an important role as this young eighth grader is making a series of online videos which tells everyone how to “find and express themselves” which of course was her own main struggle.